On the 24th March 2011 a fire destroyed the first floor and thatch of the 13th Century Pandora Inn at Restronguet. Fire fighters were however able to save much of the ground floors original features. This Friday, March 9th less than a year after the devastation she is fully restored and set to re-open. Much to the delight of locals and visitors alike. 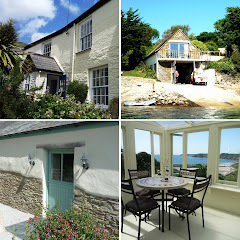 The Inn near Restronguet on the River Fal is one of the most popular pubs in Cornwall. The community was shocked when news of the fire got out, but luckily the owners and St Austell Brewery agreed to re-build the Inn as close to the original as possible. The outside looks exactly the same, but the first floor has been transformed into a stunning vaulted room with traditionally pegged green oak beams. Almost all of the structure of the ground floor including the bars, low beams and settles remain as before the fire, remarkably not a bottle was broken! So be warned, you will knock your head once or twice during your visit! The owners John Milan and Steve Bellman are conscious of the need to preserve the history of the original features, so you will find pictures, water damaged, now dried and back in their rightful place with wrinkles showing. They want to ensure the history of the Inn remains honest, and they have treated the fire as just another chapter in her colourful history. One of the features that ensure guests return visit after visit is the fantastic food Chef Tom Milby and his team create. The Inn may have new managers but the chef is returning, he uses the freshest, local, seasonal produce available. So be prepared for a fabulous fishy menu complemented by an extensive wine list and traditional local ales from St Austell Brewery. During the summer months there are plenty of picnic tables out front where you can sit and enjoy the creekside view. The roaring log fires inside make this an all year round attraction. At certain tides you can visit by boat and moor against the pontoons; be warned the river dries out to mud flats at low tides. You just have to ensure you time your lunchtime pint with the tide! Well-behaved dogs on leads are also most welcome and are allowed in the downstairs bar area. The Pandora Inn, Restronguet re-opens on March 9th 2012 at 11am. For more information do please visit their website.